Gujarat may be claiming to have provided the widest internet coverage compared to the rest of India through the state-sponsored Gujarat State Wide Area Network (GSWAN). However, a recent Government of India survey shows that access to internet in the state’s urban areas is just to 41.3 per cent of its households, which is far below the national average of 48.7 per cent. 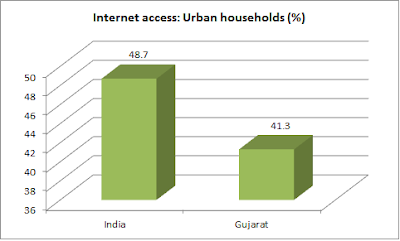 The neighbouring Maharashtra’s urban areas are way ahead of Gujarat with 64.6 per cent households having internet access. Similarly, in urban Kerala, 62.1 per cent households have internet access. Largely urban areas, Delhi’s 48.5 per cent, Goa’s 52.6 per cent, and Chandigarh’s 60.2 per cent have internet access. As against this, the NSS report says, “In Kerala, more than half of the rural households had internet access.” While the national average is 16.1 per cent, 17.1 per cent rural households of Gujarat have internet access. 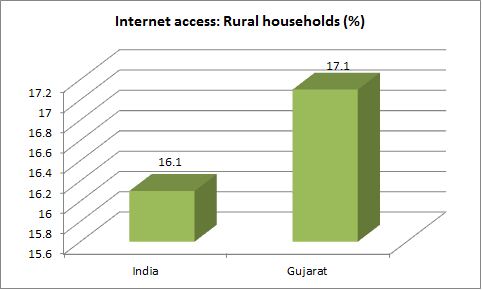 If one leaves aside household access to internet, the question still remains: How computer literate is "model" Gujarat's population? The NSS data show that just about 24.3 per cent of Gujarat's urban population in the age group 14 plus can use internet to send emails, which is worse than the all-India average of 25.4 per cent. There are ten states which perform better than Gujarat -- Himachal Pradesh (37.9 per cent), Uttarakhand (33.2 per cent), Maharashtra (33.1 per cent), Kerala (32.5 per cent), Punjab (29.2 per cent), Haryana (29 per cent), Karnataka (28 per cent), Telangana (27 per cent), Assam (26 per cent), and Tamil nadu (25.7 per cent). A further detail suggests that Gujarat's 17.5 per cent urban females are able to use internet to send emails, which is again worse than the national average of 19.3 per cent. Then, just about 3.8 per cent of Gujarat's rural females are able to use internet to send emails, which is worse than the all-India average of 3.9 per cent. Published in March 2016, the NSS survey also reveals that, in Gujarat, 14.6 per cent people (urban plus rural) above 14 years of age can use internet in order to send emails. While this a slightly better than the all-India average of 12.4 per cent, it is worse than as many as nine out of 21 major Indian states. If Kerala, with 27.2 per cent of the people in the age-group 14 plus able to use internet to send email, tops among major Indian states, Maharashtra with 20.4 per cent comes next, followed by Tamil Nadu 18.8 per cent, Himachal Pradesh 18.3 per cent, Punjab 17.9 per cent, Uttarakhand 16.1 per cent, Telangana 15.5 per cent, Haryana 15.4 per cent, and Karnataka 15 per cent. Further, in the age-group 14-29, 34.6 per cent of the people are able to operate a computer, as against 27.8 per cent in the country as a whole. This is worse than seven major states -- Kerala (77.3 per cent), Tamil Nadu (49.6 per cent), Himachal Pradesh (45.5 per cent), Punjab (45 per cent), Maharashtra (40.1 per cent), Haryana (36.3 per cent), and Karnataka (35.5 per cent).